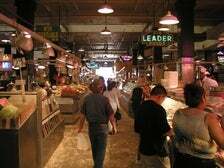 Grand Central Market (GCM) has been a Downtown L.A. staple since 1917. 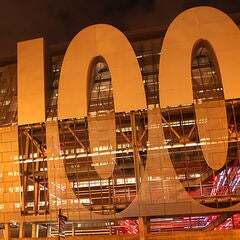 A few years back, the owners started gathering a new generation of food and drink vendors, and it wasn’t long before the market started earning national acclaim, including a collective appearance on Bon Appetit’s 2014 list of America’s Best New Restaurants. 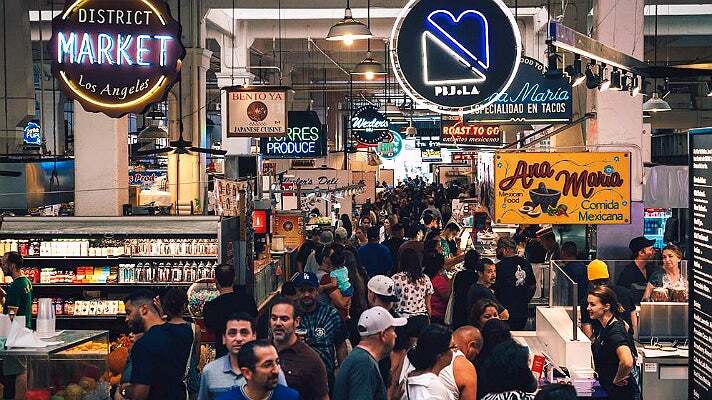 Grand Central Market recently celebrated 100 years with their strongest line-up ever. Yes, GCM institutions like China Café, Roast To Go, Sarita’s Pupuseria, and Tacos Tumbras A Tomas are still going strong, but here’s a chance to discover 18 of the best new food and drink options. Anya Fernald, who’s become a champion of meat-fueled sustainability, opened the first L.A. branch of Belcampo, which sources animals from the base of Mount Shasta. 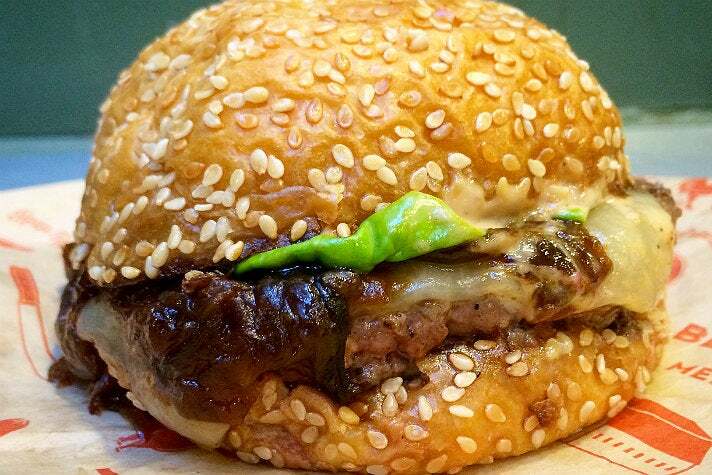 The burger at their GCM branch has generated substantial buzz, with juice spilling from its sesame seeded bun. Head chef Brent Thomas and head butcher Paul Martinez introduced a 100-day, dry-aged burger with melted raclette cheese, caramelized onions, and Dijon aioli, if you want to dial up the funk. Either way, Belcampo’s skin-on fries, cooked in beef tallow, are also devastating, but few items are safe at the counter due to available cuts and seasonality. Other interesting options include a crispy chicken sandwich with crumbled tempura ramen batter, and cauliflower salad with lemon vinaigrette. At Clark Street Bread, Zack Hall stacks enticing loaves on a counter behind the glass shield, including whole wheat, raisin & walnut, seeded, country, and Alpine that incorporates ground coriander and caraway seeds and practically begs for pastrami. 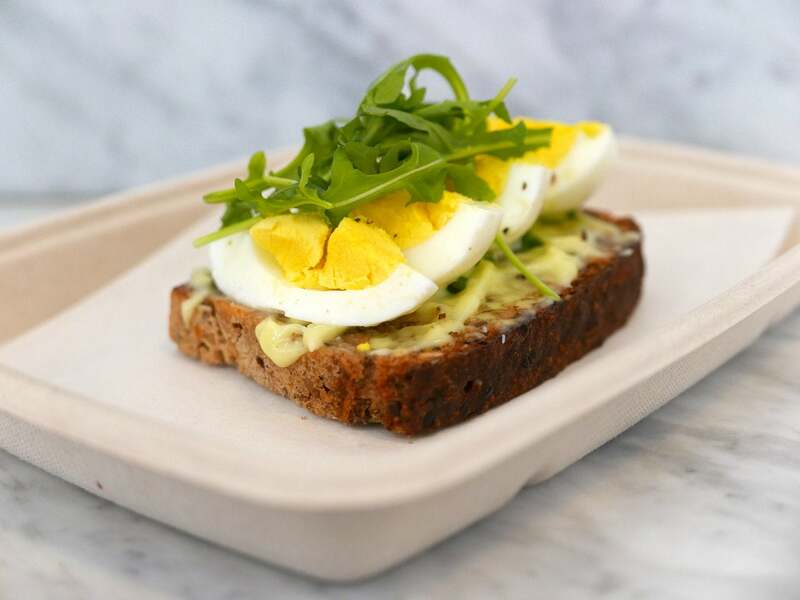 Bread forms the backbone of a toast and sandwich program that includes delectable egg smörgås with hard-boiled egg, chive, and chervil on Danish rye. You’ll also find deluxe takes on fan favorites like avocado toast and peanut butter & jelly. Globally inspired pastries include a buttery pain au chocolat with molten Valrhona chocolate batons; a judiciously caramelized kouign amann; and kanelbullar, pull-apart Swedish cinnamon rolls. Nobody should need liquid courage to buy small-batch spirits, craft beer, wine, bitters, cocktail accouterments, and bar tool from Courage & Craft on Grand Central Market’s southeast corner. 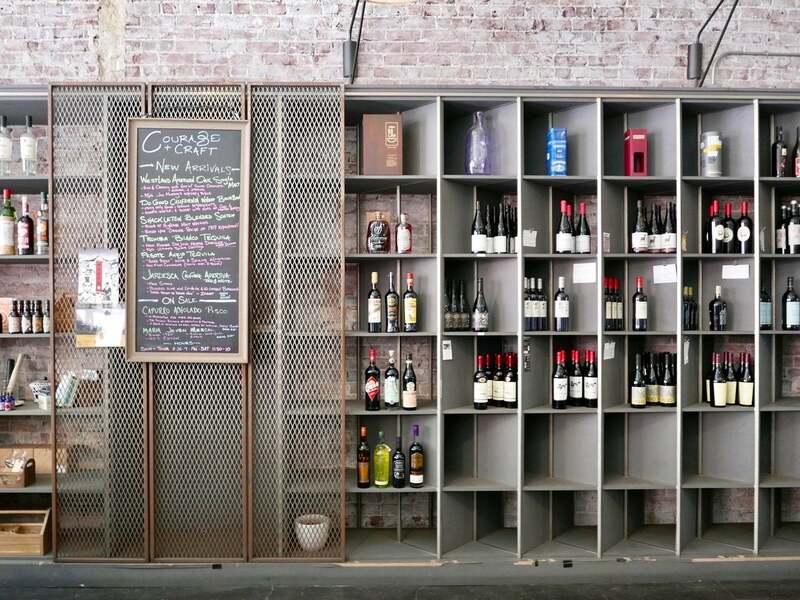 Longtime bar veterans Nicholas Krok and Ryan Duffy teamed on the stylish bar store with brick backing and metal shelves. A blackboard calls out “new arrivals” like Do Good California Wheat Bourbon (made using home-grown ingredients), Shackleton Blended Scotch (based upon a recipe from Shackleton’s 1907 expedition) and Tromba Blanco Tequila (from former Don Julio master distiller Marco Cedano). At least a couple tasting notes accompany every bottle, so you’re never buying in the dark. 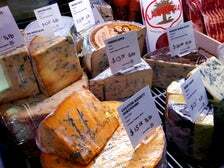 Lydia Clarke and sister Marnie Clarke built on the success of the Cheese Cave in Claremont Village by opening this cheesy destination inside Grand Central Market. This spinoff showcases two cases of cheese, a marble counter with cheese-friendly items like jam and pickles and a full kitchen framed by hexagon shaped tiles, which produces cheesy sandwiches and salads. 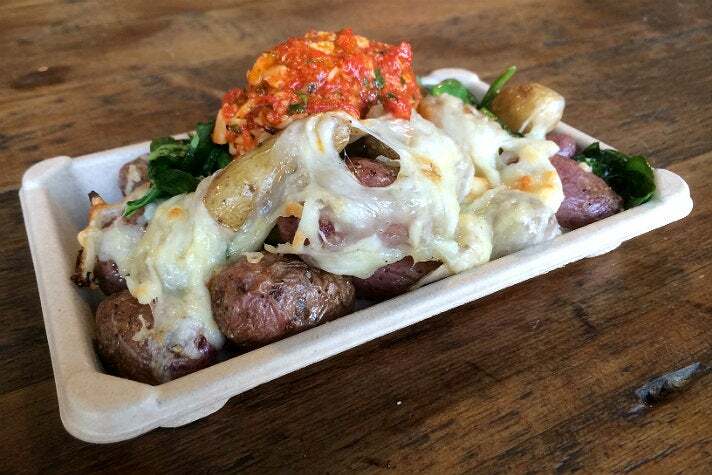 The Clarkes also offer cheesy potatoes - roasted baby potatoes are finished in cast-iron with spinach, Idiazabal cheese and a big scoop of chunky Romesco sauce. 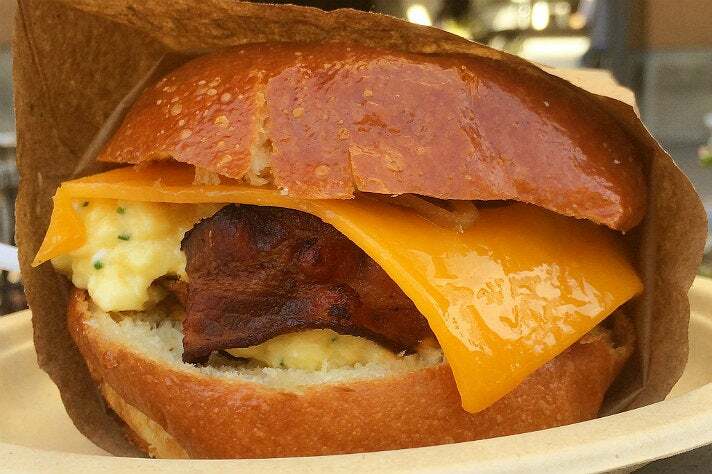 There's a bacon-forward version and both are available with fried egg. Chef Alvin Cailan and cousin Jeff Vales have taken Eggslut to the next level since trading in their truck for an egg-centric GCM stall along Broadway. 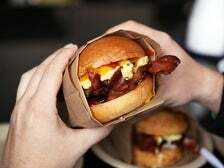 Sandwiches come on soft Sugarbloom Bakery brioche buns and include fillings like cheddar, honey mustard aioli, bacon, and/or house-made, chile-flecked turkey sausage. The Fairfax remains from when Eggslut parked outside Coffee Commissary and consists of soft scrambled eggs, Tillamook cheddar, chives, caramelized onions and Sriracha mayo. If that’s not substantial enough, consider the Gaucho with seared Wagyu tri-tip, chimichurri, pickled red onions, shaved Manchego and arugula, which of course comes with an egg. By any metric, Kyle Glanville and Charles Babinski are two of the top coffee minds in the U.S. Together, the duo, who previously worked for Intelligentsia Coffee, ventured out on their own in 2012. Now they run this bustling open-air bar, which faces Angel’s Flight at Bunker Hill, along with Go Get Em Tiger in Larchmont Village. 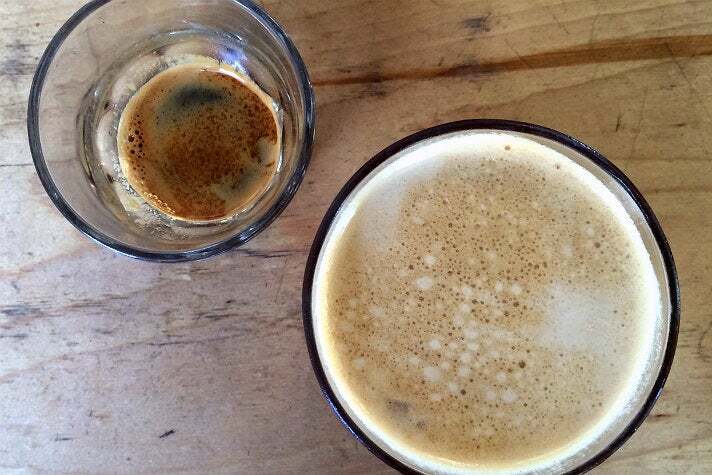 They aren’t beholden to any brands and prepare seasonal coffee with precision not typically found in cafes, going so far as to weigh espresso output. G&B has hot, rotating coffees and a full complement of espresso drinks, plus cold brew and iced tea on tap. Still, their scientific approach doesn’t get in the way of fun, as evidenced by their super-charged coffee milkshake, which incorporates McConnell’s ice cream, espresso, and ground beans. Wade McElroy and Russell Malixi recruited chef Max Henriquez in 2013 to join Horse Thief BBQ, which the duo named for Kicking Horse, a pivotal character in Larry McMurtry’s novel, “Comanche Moon.” Now they’re rolling at Grand Central Market, occupying a tree-lined, umbrella-shaded patio with communal wood picnic tables and grey walls. Order from a window, choosing from a lean menu that includes brisket, pulled pork, rib tips, pork spare ribs, chicken and sausage. 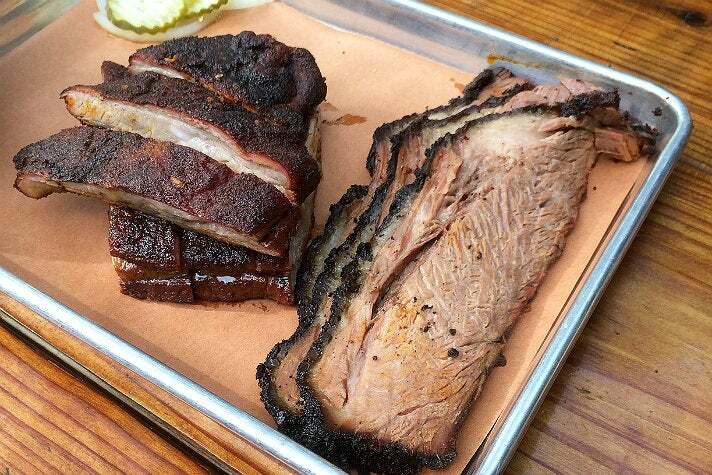 Meats are available by weight or portion, and can become plates with the pairing of two sides. The meat is oak-smoked and sides are fairly traditional, though there are relatively nouvelle options like sweet potato casserole and creamed corn. In May 2014, Horse Thief added a walk-up bar that features 10 craft beers on tap and a selection of wines. 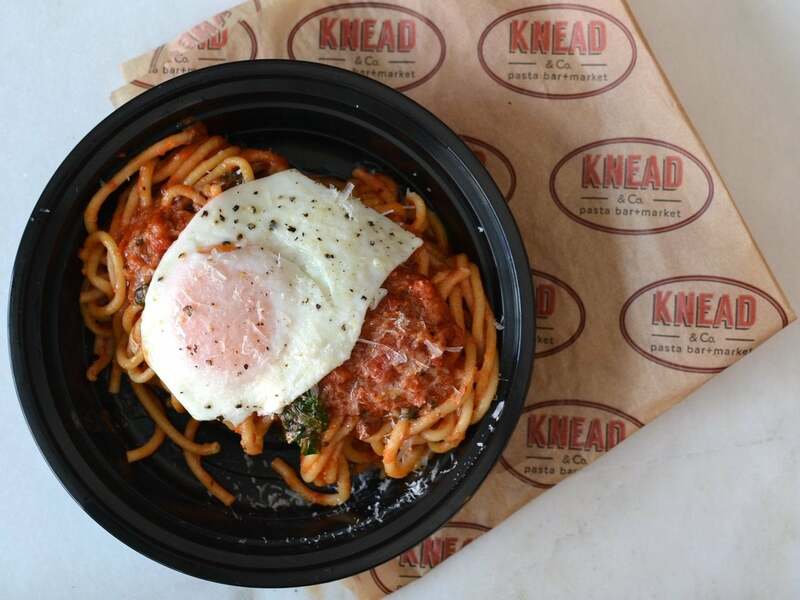 New Jersey-born chef Bruce Kalman and Marie Petulla, the team behind Union in Pasadena, are bringing casual Italian food to even more people with Knead & Co, their house-made pasta bar at Grand Central Market. Twin wood counters provide views of the open kitchen and fresh pasta display case. Knead makes three types of Pasta: Corta (Cut), Ripieno (Stuffed), and Al Forno (Oven Baked). Popular options include spaghetti & meatballs dressed with a rich “Sunday gravy” made with short rib shreds. Bucatini all Amatriciana is another hit, with chewy pasta tubes tossed with a zesty combo of guanciale, tomato, chile, basil, and pecorino. Add a vivid, cage-free egg if you’re smart. The comfort continues with chicken or eggplant Parm and fresh-piped cannoli. Chef Fernando Villagomez owns the Villa Moreliana carnitas stall at Grand Central Market, and took to the sea with La Tostadería. A neon mermaid welcomes diners to the L-shaped counter. Blackboard menus of course tout tostadas, crispy corn tortillas loaded with seafood. 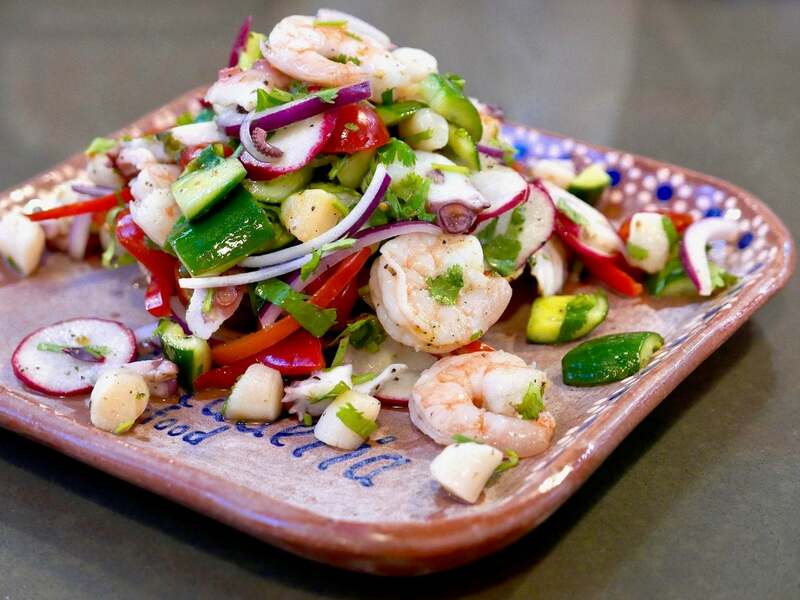 Mixta is an overflowing mix of octopus, scallops, shrimp tossed with ingredients designed to add tang, spice, and texture, including cilantro, cherry tomatoes, red onions, red bell peppers, radishes, like juice, and habanero. Their chile pepper spice meter spans from 0 to 4, and this tostada rates a solid 3. They have seafood cocktails, fiery shrimp aguachile, and seafood soup loaded with black cod, shrimp, and vegetables in a guajillo dashi broth. Tacos feature proteins like fried wild shrimp and black cod, and charred octopus. It’s unclear how this fits into the original vision, but La Patrona Burger is a beast, featuring a patty of griddled shrimp and Oaxaca cheese with lettuce, avocado relish, tomato, crispy potato, and chipotle aioli on a sesame seeded burger bun. A marble counter and white subway tiles are the setting for Madcapra, a fast casual Mediterranean concept from chef-partners Sara Kramer and Sarah Hymanson that specializes in their signature square falafel crafted with garbanzo and fava beans, coriander, onion, and garlic. Four different color-coded compositions are available in either supple flatbread sandwiches or as part of salads. The duo started with red and green, but eventually found two more colors in the falafel rainbow: orange and yellow. 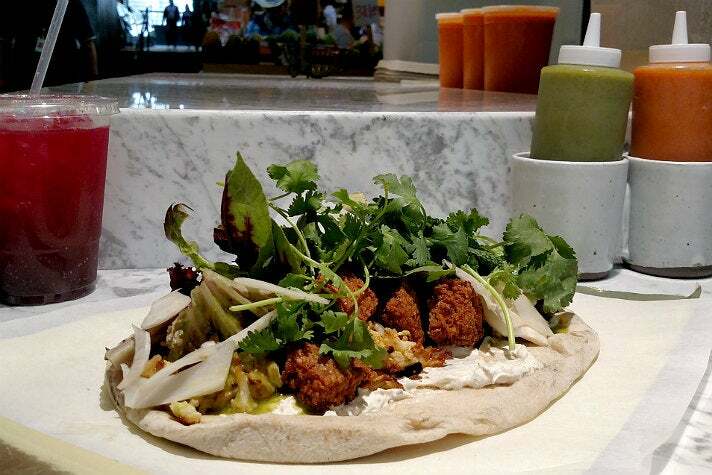 Green falafel is particularly noteworthy, co-starring crunchy cauliflower, fennel, tangy lebneh, and cilantro. Orange has even more color and pop thanks to carrots, spinach, pickled hot peppers, walnut yogurt, and dill. To drink, consider sumac beet soda or fragrant orange blossom yogurt drink sweetened with syrup made from orange zest. 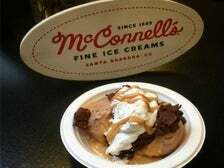 The husband and wife team of winemaker Michael Palmer and chef Eva Ein took over McConnell’s Fine Ice Creams in 2012. The Santa Barbara icon dates to 1949 and the couple expanded to Grand Central Market in July 2014. Their business is vertically integrated, complete with a Santa Barbara dairy, ice cream manufacturing facility and bakery. With relationships that span generations, McConnell’s sources dairy, produce and chocolate from California producers. Popular flavors of luscious ice cream include classics like salted caramel chip and sweet cream, plus seasonal flavors like marionberry with lemon, pumpkin pie and peppermint. Grab a cup of hand-folded waffle cone. 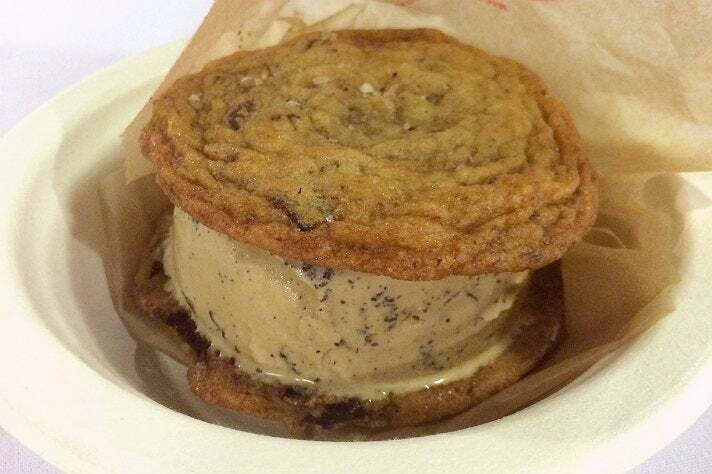 Their ice cream is also glorious between cookies. Brad Kent trained at the Culinary Institute of America and worked for chefs like Charlie Palmer and Joachim Splichal before opening the first Olio Wood Fire Pizzeria in 2010. His pizzas proved popular on West 3rd, so he was able to expand to Grand Central Market in 2014. 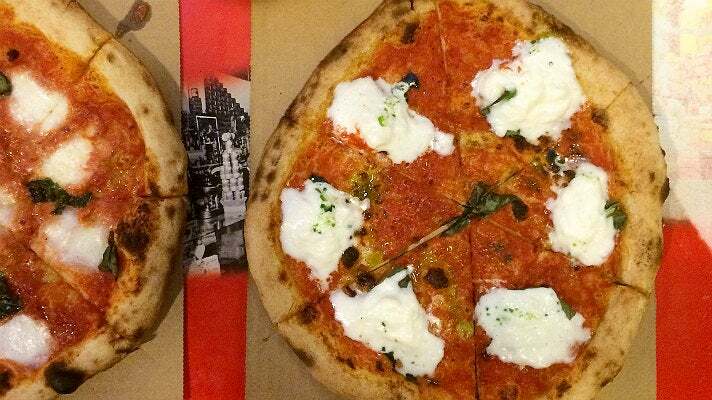 Olive wood fuels a Stefano Ferrara oven, which yields premium 10-inch pizzas, including two tiers of Margherita. 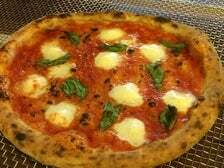 The Margherita Plus includes tomato sauce, basil, creamy burrata and basil infused olive oil. 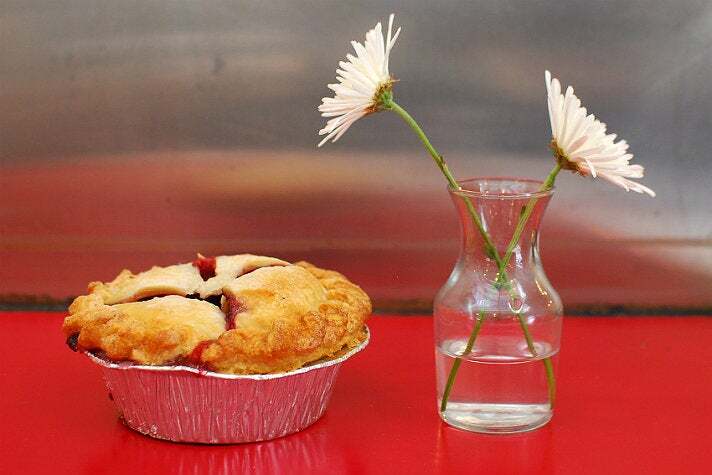 Specialties include a delectable Wild Mushroom & Crisp Prosciutto pie with roasted garlic and caramelized onion sauce. 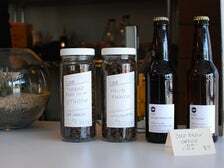 Olio is also your best bet at Grand Central Market for craft beer. Christophe Happillon, who stacked thousands of oyster shells at farmers markets and restaurant pop-ups educating people about each varietal’s merroir, finally found a home along Hill Street. 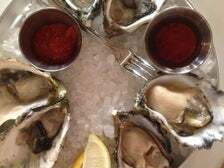 His long-awaited stall, which has a dramatic retractable shell, dispenses pristine oysters with mignonette and lemon wedges. The rotating selection could consist of Chicoteague (Virginia), Baron Point (Washington), or Fanny Bay (British Columbia). 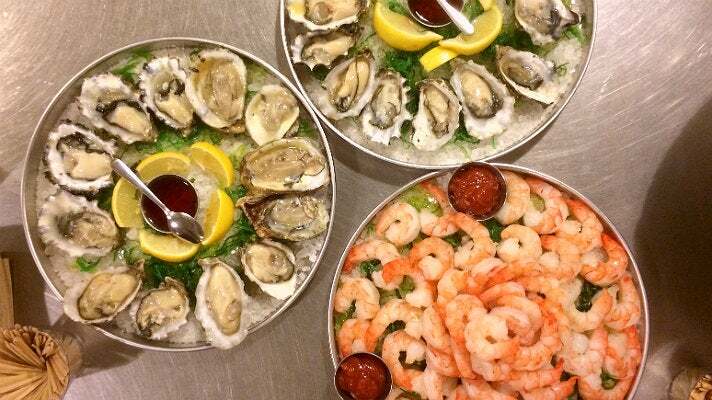 Littleneck clams and scallop ceviche are also available on the half-shell, along with shrimp cocktail, tuna poke and seaweed salad. The Oyster Gourmet also sells wines by the glass. 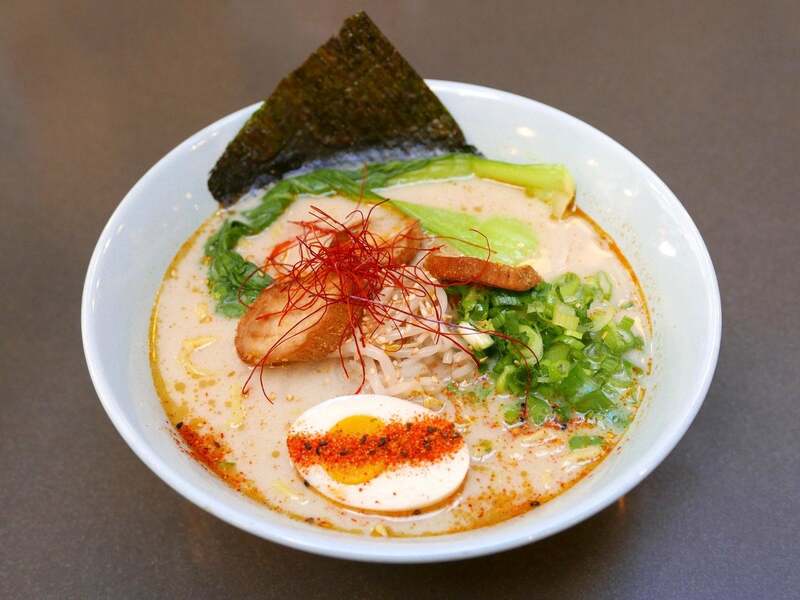 A neon green arrow directs you to black metal stools at Ramen Hood’s long grey counter. 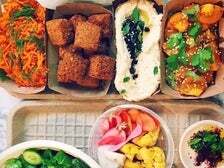 There’s no evidence that Ilan Hall and chef Rahul Khopkar are stealing from the rich to feed the poor - Robin Hood style - but they are serving flavorful vegan ramen bowls. OG ramen loads a milky, nutty sunflower seed broth with nori, King oyster mushrooms, chile threads, bok choy, bean sprouts, sesame seeds and scallions. Alternatives include spicy ramen and “cold smokey” ramen with smoked onion broth and buckwheat noodles. Consider adding a creative vegan “egg” that pairs soymilk and sea salt “whites” and “yolks” of spherified nutritional yeast, carotene, black salt, and Vitamin B. The result isn’t as firm as a chicken egg, but a savory dusting of shichimi togarashi helps. 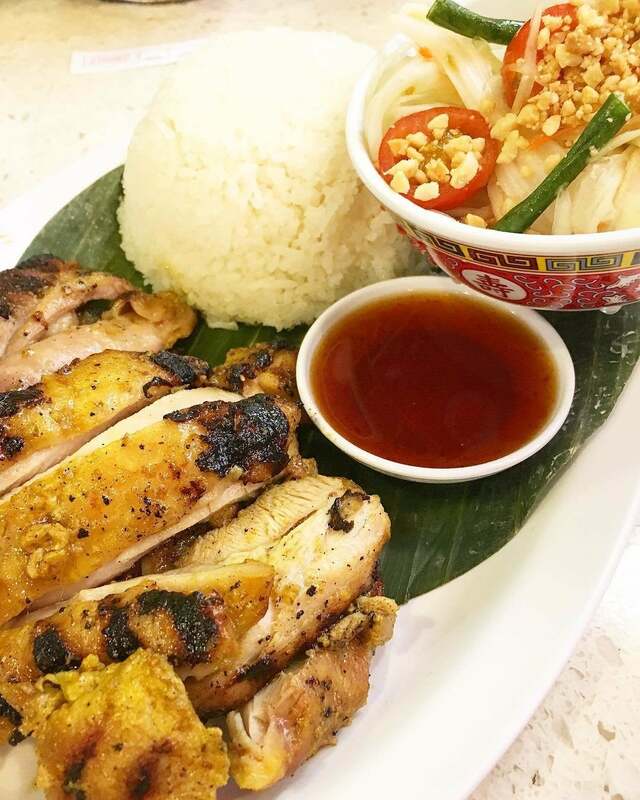 David Tewasart helped to spark Grand Central Market’s revival by opening Sticky Rice, a northern Thai lunch counter with luscious grilled meats, fierce hand-pounded papaya salad, and the namesake ingredient, which doubles as a utensil. Your best bets for proteins are gai yang, succulent chicken that’s prepared sous vide, grilled, and served with sweet chile sauce; and seau rong hai, juicy slices of “crying tiger” steak that are prepared the same way and served with fiery hot sauce. When mango’s in season, their mango sticky rice with coconut milk, is essential. Textbook Thai tea is a year-round treat. 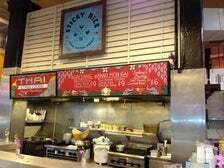 David Tewasart doubled down in late 2014 by opening a noodle counter behind the original Sticky Rice. Sticky Rice II features a colorful pegboard menu with 12 different dishes available with a choice of protein (or combo). 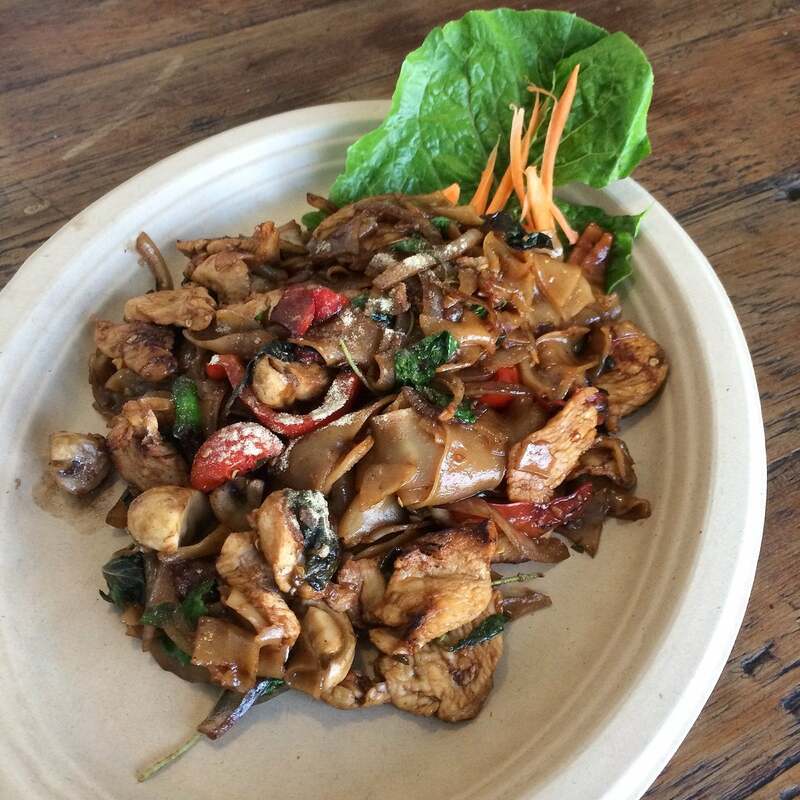 That includes dishes like appropriately funky, “street style” pad Thai. You’ll also find noodle soups like khao soi with a spicy curry broth and noodles boiled and deep-fried, sliced red onions, and pungent pickled mustard greens. Sticky Rice II also serves impressive crab fried rice and pad kee mow - drunken noodles tossed with onions, basil, mushrooms, cherry tomatoes and chiles. Finish with kanom krok, crispy, half moon-shaped coconut pancakes. Valerie Gordon and Stan Weightman built on the success of their grab-and-go chocolate and confection house near Silver Lake by opening this versatile counter at GCM. In the morning, look for egg sandwiches, hearty breakfast bowls and French toast with maple syrup butter. Lunch brings sandwiches and salads, including cold fried chicken with coleslaw on ciabatta and a play on banh mi with smoked salmon. Sides in the case are highly seasonal. Gordon’s baked goods include hand pies enlightened with cream cheese, Brown Derby grapefruit cake and chocolate mole brownies. Chef Micah Wexler and front of house partner Mike Kassar, who earned acclaim with Mezze in West Hollywood, delivered this old school Jewish deli counter in April 2014. 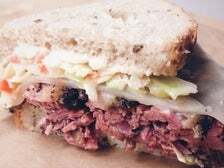 They house-smoke meats and fish like pastrami, sturgeon and salmon, which contribute to high-value sandwiches and platters. 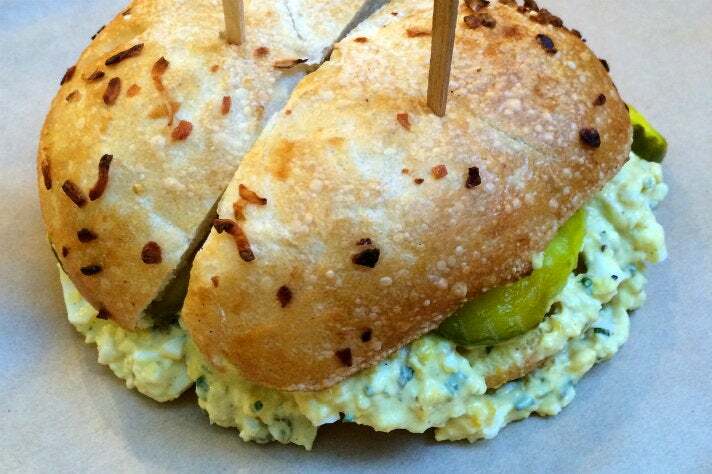 Wexler worked with a local bakery on bagels, which form the backbone of the breakfast sandwiches. Egg salad, tuna salad and roast turkey co-star, as do black-and-white cookies, babka, chocolate egg creams and phosphates. In a city of nearly 200 languages and 90 neighborhoods, everyone has a voice. 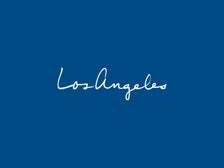 Los Angeles is not only one of the most diverse cities in the world, it’s also one of the most culturally vibrant. From Thai Town to Tehrangeles to Little Osaka, the entire world is under the Hollywood Sign.